If you're looking for a big bowl of comforting deliciousness then this is for you. This chili had everything I was looking for, it was creamy, spicy, and oh so comforting on a cold and wet night. This chili keeps and reheats really well - I ate this three days in a row! 1. Heat oil in a large saucepan. Fry the onion, Jalapeño, garlic, and chorizo over a medium heat for about 3 minutes, until onion is cooked. 2. Add the chicken, cumin, chili, oregano, paprika, and cayenne pepper. Mix well and brown chicken on all sides. 3. Add the tomatoes, chicken stock, bell pepper, and cannelloni beans, Bring to a simmer and simmer for 30 minutes. When there is about 6 minutes cooking time left, add the shrimp. 4. Mix in the cream cheese and stir until it is completely melted. Season with salt and pepper to taste. 5. Laddle into bowls and top with grated cheese. You had me at the jalapenos and cheese! This. Looks. WONDERFUL! This totally ROCKS! I love the cream cheese added to it! Creamy and delicious! G'day What a great dish! Pinned! 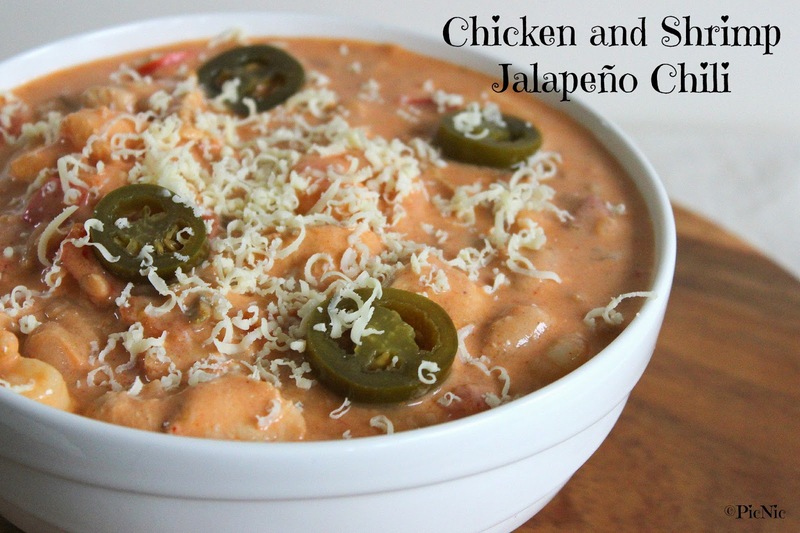 I definitely am craving some comfort food right now.. think I have found the perfect recipe in this chicken and jalapeno chili! Thank you so much for joining in the celebration tonight on #PureBlogLove , we enjoy having you each week. I hope to see you next week on Thursday 8 pm est - through Sunday night. Sound delicious, love the idea to use cream cheese in a chili!